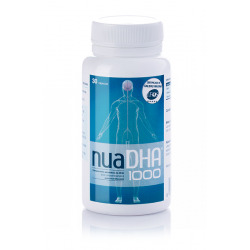 NuaDHA® 1000 is a food supplement with one of the highest concentrations of DHA(docosahexaenoic acid) (min. 1000 mg/soft gel) and omega-3 (min. 1.100 mg/soft gel)worldwide. In addition, it is one of the most purified DHA products, which explains its remarkable effects on the body. NuaDHA 1000 has a high bioavailability since it is present on a triglyceride form. In the human body, DHA is part of important tissues such as retina, nervous tissue, the brain’s gray matter, kidneys as well as reproductive organs or the skin. Its broad presence in the body makes it into a real"antiaging" nutrient. The human body cannot synthesise sufficient DHA and therefore,everyone is deficient in this nutrient (our diet supplies 100-150 mg/day), and thus depending on the diet to acquire it. 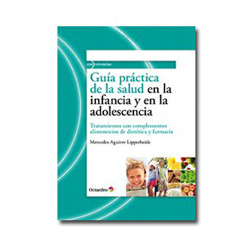 The minimum nutritional requirements are 250-300 mg DHA/day. The uptake of 1 soft gel/week of NuaDHA® 1000, together with the amount present in our diet, can fulfil the weekly needs for this nutrient. However, taking DHA for longer periods of time and higher doses results in increased benefits for the organism. One can take 1 soft gel a day preferably with a meal or even a higher dose (eg. 2,3 or 4 soft gels), depending on the need.